Summer is here, and the nectarines are in season. Most people think of preserving these beauties in the freezer, but canning nectarines works well too. Add a little bit of spice to your nectarines this year with this recipe. Just like peaches, nectarines come in freestone and clingstone varieties. Freestone is the best to use for canning because it is the easiest for freeing the pits from the flesh. Nectarines have a bolder taste and aroma compared with peaches. Nectarines come in white and yellow flesh varieties. Both of these have dark red skin that is smooth and edible. White nectarine flesh contains more sugar and less acid, for a pleasantly sweet flavor. Yellow nectarines are more acidic and have less sugar. The most popular freestone varieties of nectarine in the grocery store are Sunglo and Zephyr. However, it is likely that you will not be able to tell what you are getting from the description on the bins. The best way to select nectarines is to smell them and gently squeeze them. A ripe nectarine ready for eating will be soft, fragrant and will give to gentle pressure at its top. Don’t bother with green nectarines or those that are clearly after their prime – too hard, cracked, bruised, or have blemishes. Blueberries give this recipe a boost of vitamin C and an acidic pop that works wells with the sweet sun-kissed nectarine. They work well together! With little effort, you can even grow blueberries in containers [post link] and freeze them for later. Choose either fresh or frozen berries for this recipe. If using fresh berries, wash them and take a minute to ‘pop’ them before adding to the bottom of the jars. Ginger is a popular ingredient in cooking and is often used for culinary and medical purposes, especially for digestion issues. These blueberry ginger spiced nectarines might not ease a tummy ache, but the warm, spicy bite blends well with the acidity of the blueberries and the sweetness of the nectarines. Honey will give your canned nectarines an earthy flavor that most people enjoy. The best honey for canning nectarines is mildly flavored and light in color. Using honey gives you the benefit of a natural sweetener without having it overpower the taste of the peaches. Honey is a stronger sweetener than sugar. You’ll only need to use ¾ a cup of sugar for every 1 cup of sugar. Using honey will also darken the fruit a little more than if you used sugar to make a syrup. NOTE: Honey is adult food, not suitable for children under 18 months old. Take that into consideration when you are doing your canning. Be sure that you properly mark the jars after processing so you will not share this batch with little ones. ★ Did you make this canned nectarine recipe? Don’t forget to give it a star rating below! 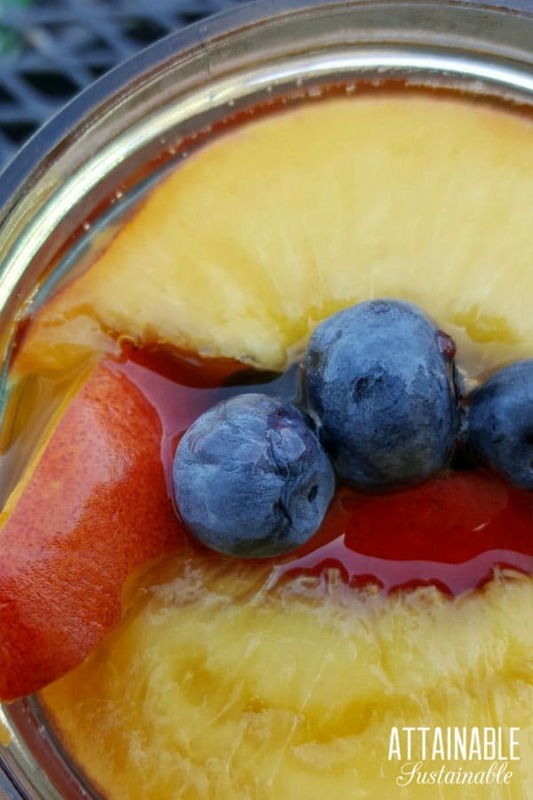 Canning nectarines with fresh ginger and blueberries gives them a flavorful pop! Cut each nectarine in half, remove pit, and then cut each quarter into three pieces. To keep the fruit from darkening, place the slices in water containing lemon juice, ascorbic acid (3 grams ascorbic acid to 1 gallon of cold water), or vinegar. Drain. Add ¼ teaspoon fresh grated ginger, plus 1 tablespoon blueberries to the bottom of each jar. 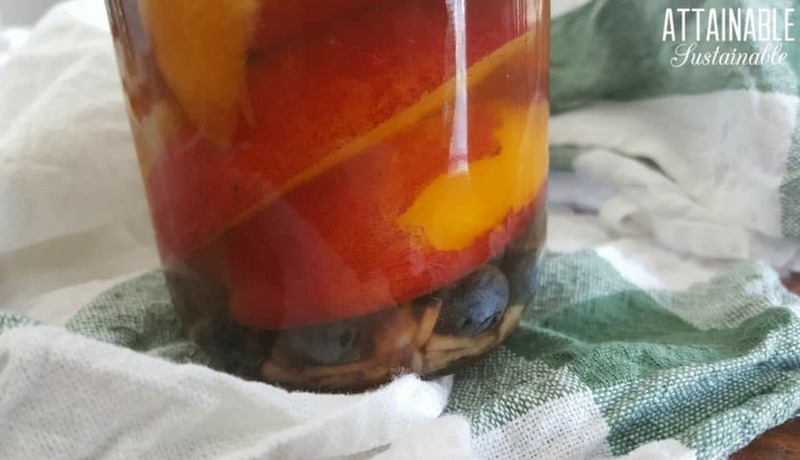 Pack nectarine slices into pint jars, leaving ½ an inch of headspace from the top of the jar. Boil 4 cups of water and add ¾ cup honey to make light honey syrup. Cover the nectarines and spices with boiling light honey syrup, keeping the ½ inch headspace. Swipe a butter knife or spatula around the outside of the jars to release air bubbles. Cap the jars. Store in the refrigerator for up to two weeks, or process as directed below. Be sure to leave at least ¼” headspace. Wipe rims clean and place lids and rings onto jars finger-tight. Process jars in a water bath canner for 25 minutes per pint or 30 minutes per quart using a raw pack method. After processing, remove jars from canner and allow to cool on a towel for 24 hours. Before storing, check for seal. Store sealed jars in the pantry. Opened or unsealed jars of canned nectarines should be kept in the refrigerator. Makes 6 pint size jars. Be sure to save the nectarine pits so you can try to grow your own nectarine tree from seed! Nectarines and peaches look similar, but there are some marked differences between the two stone fruits. The most obvious is the skin. 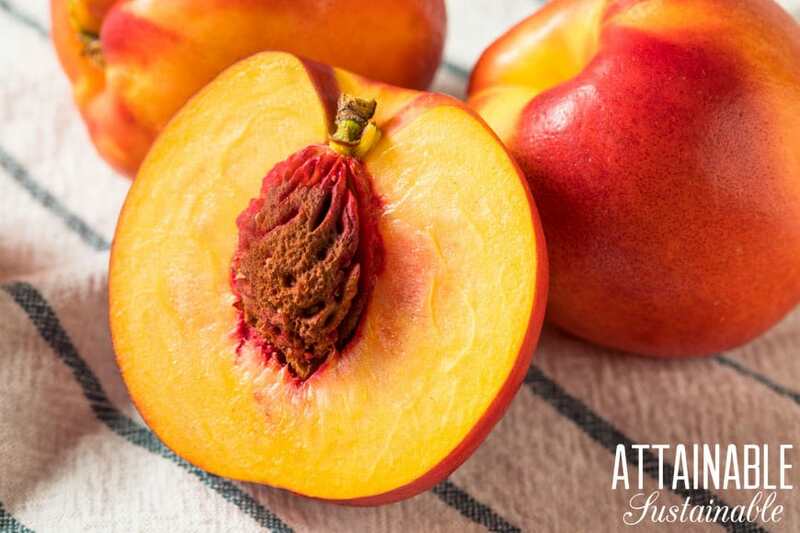 Nectarines have smooth skin, while peaches have fuzzy skin. The skin of both nectarines and peaches is edible, but the fuzziness and thickness of peach skin can be off-putting for some people. Both come in freestone and clingstone varieties. Nectarines and peaches both come in yellow and white fleshed varieties. Both can be grown from seed, as described here. Shelle Wells is the author of Prepper's Dehydrator Handbook (Ulysses Press, March 2018) . She lives in Central Texas and writes about food storage, gardening, and homesteading on her website Rockin W Homestead.